Consolidate your view of SAP Concur data in near real time with customizable reporting. 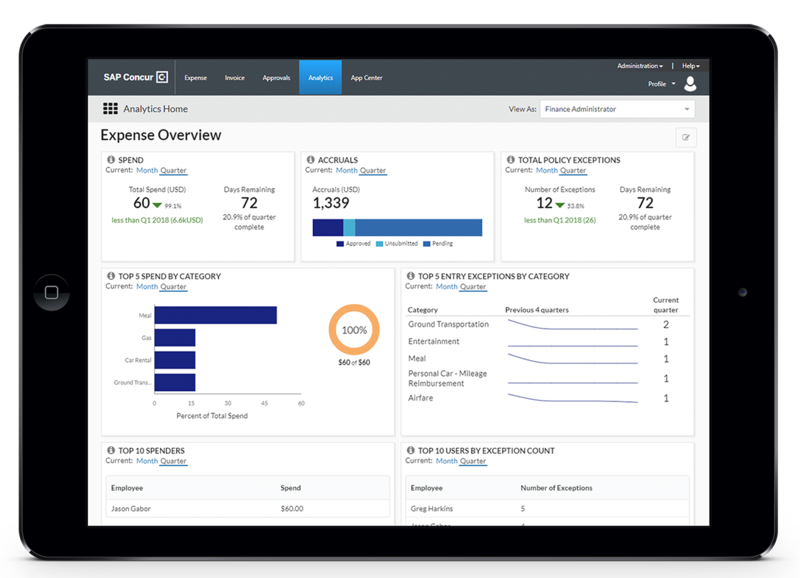 Analytics collects and synthesizes data from your SAP Concur solutions for a single comprehensive view into your spend. Your data is automatically refreshed in near real time so you can make decisions that directly impact cash flow. Analytics delivers digestible information at your fingertips in an intuitive format. Dynamically filter, group, or edit reports and dashboards to tailor information to your specific needs. Conveniently schedule reports and distribute them to key stakeholders so they always have the right information at the right time. Stay on top of your spend to better manage your cash flow and spend against policy with scheduled alerts. Enhance your Analytics experience to get unlimited hours with reporting consultants who can help you develop your reporting strategy and add value. Complete the form to have a sales representative contact you, or call +65 6664 4800 today. Fill in the below and a sales representative will contact you.